Well it's happened -- its month four and I've fallen behind on Isla's monthly update!! I'm only two weeks behind so I'm calling it a win ;) Getting anything done with a infant, 5 year old, and busy wedding season just beginning is giving a huge does of reality. Maternity leave is over and relearning that mommy/business balance is beginning all over again. Good thing these kiddos are cute!! Isla learned to roll over this month and gradually she has gotten stronger and stronger. Now, nearly every time I place her on the floor seconds later she's on her tummy looking at the world around her!! She laughed for real this month and it is pure bliss. She has the BEST little giggle and I can't wait to hear it more in the coming months!! She's still a little cooer and it's pretty much the best!! It was FINALLY warm enough to sit out on the deck and watch big brother play. Isla LOVES the sunshine, just like her Mommy!! I'm pretty sure we can feel some teeth in there - there's certainly enough drool to make near hourly outfit changes necessary!! Sleep is OK. Isla has an established bedtime of 6:30pm/7:00pm which is GREAT. The daily wakeup call of 4:30am, not so much. We're pretty sure we see some red hair coming through, but WHO KNOWS?! She's started to slowly bring things up to her mouth which is really fun to watch her do!! Isla loves to sit up (with some help) and MUST see the world around her!! We've quickly discovered the old adage that no two babies are alike to be completely true!! While in some ways she is similar to her brother, Isla is a very different baby than he was. She doesn't seem to sleep the same, she doesn't eat the same and her personality is very different. Since we are nearly five years removed from the infant stage of parenting, it's been a learning curve to say the least!! Equally as amazing though, is how much her big brother loves her. To watch them interact, to see him loving her, to know that they will carry a special bond together for the rest of their lives is something I will cherish forever!! Around week seven she start smiling and hasn't stopped since. Her smiles are wide toothless grins that can brighten anyone's day. Her Daddy says her smile can melt ice, it sure is melting our hearts!! I told Dave to be gentle with Isla one night as he was changing her diaper. She's a delicate little flower I proclaimed. Immediately she let out the loudest fart imaginable. BABIES!! She is quickly outgrowing all her three month clothes. With a slow start with her weight, every growth milestone we hit is a victory around here!! Around week six I started to wonder when I would start to hear her darling coos and I'm happy to say she is a cooing machine that warms my heart and makes me smile!! Isla stayed with my parents for our first date post baby (if you don't count going to see Star Wars at two weeks postpartum ;)) We enjoyed the first part with her as we went out to breakfast then spent the afternoon at the movies. What a treat!! She still doesn't take a paci - the other night she sucked on one for a few minutes and we nearly celebrated until it promptly was spat out of her mouth in disgust. Oh well!! The only thing that is predictable in this little one's schedule is that she will sleep right after her morning feed -- for several hours!! And while I can't predict anything else, that morning nap is great for Mom!! How can we possibly already be at one month old!! It hardly seems possible. Honestly it hardly seems possible that our house is filled with the joy of a newborn again. It's surreal, amazingly, wonderfully, surreal!! When Jonathan was a newborn I documented his first year of life through a series of monthly blog posts. And while I might have been the only one who cared enough to read them, it was a joy for me to remember that fast first year and document all the change he underwent. I knew that I wanted to do the same thing for our baby girl and here I am today, ready to share the first post!! This time has gone by so fast - so, so fast. I remember the night before my scheduled c-section Dave and I sat together and through tears I cried that I wished it was a week from today. I was terribly afraid of what lay ahead and now here we are five weeks later. Having a scheduled c-section this go around felt much different than my experience with our son Jonathan (who was an emergency c-section after nearly two days of labor.) Walking into the OR room first thing in the morning was a strange experience. I found that surgery this go around was a bit more traumatic then I was expecting, recovery has been much slower than last time and the entire experience was much different. BUT our darling daughter has been the gleaming light through it all and has made whatever experience we had so entirely worth it!! Ms. Isla Rose -- many people have asked us how we chose her name. The short answer is we liked it :) After our 10th anniversary trip to Scotland in 2016 we fell in love and so on a whim we decided to look into Scottish names. I stumbled upon Isla one day and it just kind of clicked. Dave liked the name Rose and together it seemed to be the perfect fit for our baby girl!! Isla's birth experience felt entirely different than Jonathan. Instead of being a week late like J, she was a week early. Instead of an emergency surgery, her's was schedule for first thing in the morning. Instead of bouncing back like I did with J, my recovery took time. Isla is also a very different newborn than Jonathan. She was very jaundice and sleepy the first three or so weeks of life. Feeding wasn't nearly as easy as it had been with Jonathan and it took a lot of work for me and her to find a groove. I think at week 5 we are JUST starting to find it but we've got a long way to go. Because of the jaundice and feeding issues Isla lost a bit of weight by the time she left the hospital and we've been playing catch up ever since. She's never looked unhealthy or too skinny, but the scale let us know that she needed to gain a LOT more weight and quickly. Isla LOVES her big brother, probably more than anyone else. She coos and smiles at him any time he's around her and he of course LOVES that!! He's equally infatuated with her and it makes us beyond happy. Jonathan has been an amazing big brother so far and we are so grateful!! We celebrated two Christmas' and New Years with Isla (she liked to party at night in case you're wondering ;)), and spent most of the first weeks of her life cooped up in home due to the insanely cold weather (-20 degrees anyone?! ), sickness and recovery. Not much traveling or outdoor activities have been had aside from heading to the doctors office. Isla usually wakes up around 2-3 times a night, woof, a little different than Jonathan. We'll definitely be excited for the day when she makes it to 4-5 hour stretches!! Isla feels like a different baby than Jonathan in so many ways - She HATES the pacifier!! And being swaddled!! And being on her back!! And being cold!! What she does love is sleeping on your chest. And while that makes getting anything done near impossible - with her curled up next to your chest, well there really isn't anything better in the world!! After our struggle with miscarriage and infertility, to find out that we were expecting this past spring was such a surprise. We were a mix of excited, apprehensive and how the heck did this happen? We had just come to a place emotionally, spiritually and mentally where we had accepted our family the way it was and we were at peace. Then came the surprise of all surprises and we found ourselves dreaming about the future as a family of four again. I knew that having a maternity session to celebrate this gift of our baby girl would be really important to us. We wanted a session to celebrate our relationship (11 years of marriage! ), our family of three, the anticipation of our second baby and to remember the struggle we endured the past two years of infertility. When it came time to choose a photographer I knew just who I wanted to help us document this time in life. I have long admired Beth's work, particularly her film work and fell in love with the soft, romantic feel of her images. I was so thankful she was available and excited to photograph our maternity session and all the stars aligned for a fall session at our favorite place, Crane Beach this past October. We're SO excited to share that Baby Parker is a GIRL!!! Dave and I found out a week and half ago during our anatomy scan (the big ultrasound they do during the middle of pregnancy to check the baby's organs and growth). We decided we had wanted to find out privately together to have time to process what the sonographer said. That ultrasound was a big milestone for us...one we had been waiting for, for a long, long time. It was a real treat to find out together - after waiting for our miracle baby!! This past weekend we invited family over for a BBQ to share the news with them!! We had been badgered by close family and friends alike for us to spill the beans (I would have done the same ;)) but we kept our lips sealed -- even Jonathan didn't know!! 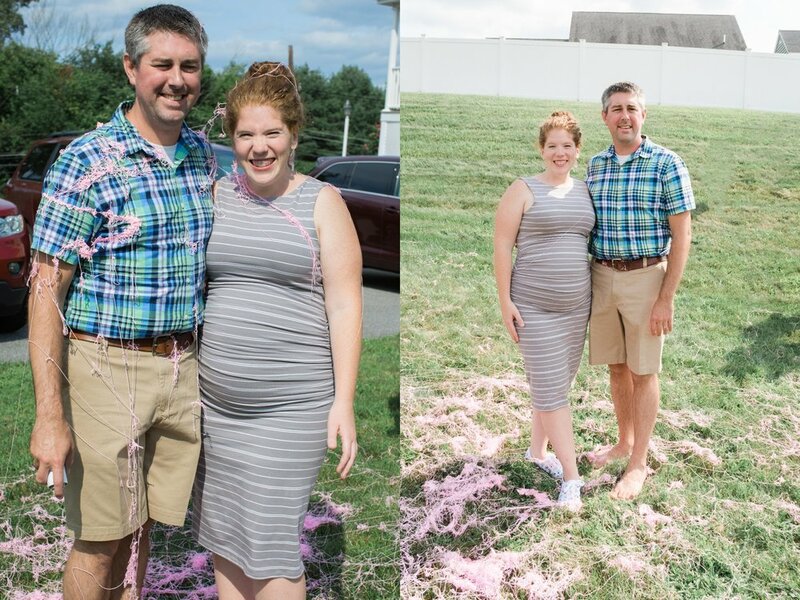 It was fun to get sprayed in silly string and reveal our baby's gender!! The question we have been asked so far is do we have a name? And yes, we do. But we're going to sit on it for a while. It's a little different, but we keep coming back to it again and again. Maybe baby girl is trying to tell us something!! I'm feeling great these days, though I'm missing my waistline. Baby Girl is kicking non stop and is always moving -- we're in trouble!! With each kick and movement I'm reminded of what a miracle this little girl and for how long we have prayed for her. I might be pregnant but definitely I'm feeling all the things!! We took a short video clip of our reveal with family. Jonathan decided to start yelling at people to stop spraying silly string at him and his Mom -- our "perfect" little moment turned into real life, real fast -- hahaha. Oh memories. Jonathan is really excited for a sister. A few weeks back he changed his wish for a brother to a sister and has never looked back. He must have known!! Baby Girl Parker is going to be surrounded by a loving clan of boys!! Here are the four cousins!! I can't believe I've been able to keep this secret this long -- it's seemed like an eternity to reach this point - the second trimester of pregnancy!! It's also surreal to actually be sharing this with you. I never thought we'd be given another chance to have a child. We've been trying to grow for our family for over two years. What we thought might take just a few months turned into a journey we could never have imagined. Months of trying, a positive test, a subsequent miscarriage. Heartbreak. Over a year of trying again. A diagnosis of infertility. Heartbreak. Testing, pokes, prods, tears. Heartbreak. Injections, medicine, a failed IUI. Heartbreak. Giving up. Heartbreak again. And then unexpectedly, against all odds, our miracle : a positive pregnancy test. It's been a painful journey to reach this point. When we finally saw those two pink lines we were reserved. With each ultrasound, each check up we became more and more hopeful, reassured that this was really happening. Someday I may share more about our journey with secondary infertility, but for now here we are. 16 weeks pregnant and delighted to be awaiting the arrival of our new addition later this year!! Create Your Next Card with Minted! I’m excited to share that Deborah Zoe Photography has partnered with Minted to offer truly unique cards for you this season!! Come take a peek at my Minted Storefront at http://deborahzoe.minted.com and start your search for this year's perfect card!! From Save the Dates and Announcements to Holiday Cards — Minted.com offers a selection of unique and affordable cards!! Each piece is artfully crafted with thick card stock and offers a beautiful tangible experience. I love Minted so much, that they have been my personal card of choice for our own announcements and Holiday cards for years!! Email to let me know you are ready to order your cards!! I will upload your preferred images directly to Minted so you can customize and order your cards. Look out for an email from Minted with the Subject line "Your Photos are Ready at Minted.com". Click through the link. You may want to make sure you have a good internet connection while you do this to make sure the photos import properly. Happy Halloween Friends!! It's hard to believe another year has rolled on by -- last year I actually missed Halloween having been stranded in Austin after their airport flooded!! But this year we're home and we took full advantage of a weekend together to celebrate fall. On Friday we took Jonathan to our church's Fall Festival -- a night of games, food and of course costumes and candy. On Saturday hung out with cousins, played in the leaves and visited some farm animals. Then on Sunday I helped Jonathan carve two pumpkins -- he was beyond thrilled to have his very own jack-o-lantern!! Each year for the past three Halloweens my Mom and Dad have made Jonathan's costume. Growing up each year my Mom would hand sew my own Halloween costumes and they were incredible!! It's been a fun tradition to pass along to Jonathan -- but this year he wanted to be a fireman and well, we already had everything needed to be the Fire Chief!! So you guessed it, this year Jonathan was a Fire Chief for Halloween, complete with a water pump back and megaphone!! In celebration of Halloween, candy and all things FUN, I thought I'd share Jonathan's Halloween costumes from the past three years -- this will be his fourth Halloween!! How can that be?!! Enjoy!! Today is the third installment of our 10th Anniversary Trip to the United Kingdom!! If you're just stopping by, this past July we celebrated 10 years of marriage with an unforgettable trip to London & Scotland. If you missed it, you can check out PART 1 and PART 2! Today we're finishing our trip with our last day on the Isle of Skye, Edinburgh and a short jaunt back to London before we left for home. Highlights include sheep (lots of sheep! ), scenic views and hairy "heilan coos"!! Sharing these images have been an incredibly fun way to relive our trip -- which went by in the blink of an eye -- just yesterday we were asking "Did we even go away?" It's crazy how you can plan and plan for a trip and then it's here before you know it. The last and final installment of our trip series I will be sharing where we ate, some of our favorite things and a quick review of our hotels and experiences. If you're planning a trip to the United Kingdom in the future, specifically London & Scotland, you won't want to miss that post!! Today, enjoy some of our favorite images (and memories) of the trip in PART 3. Questions about our trip? Feel free to share them in the comments!! I've been trying and trying to narrow down my favorites from our recent trip to the United Kingdom -- Scotland is proving to be extraordinarily hard!! I mean I just cannot pair down the amount of beauty that is the land of Scotland, there's just SO much to share!! So instead of the planned single post for Scotland I've broken it down into two postings. The first being today!! I cannot believe that our 10th anniversary trip to London & Scotland has come and gone. It feels like we had been planning this trip forever and with most vacations it was over in the blink of an eye. It was an incredible trip and lovely way to celebrate a decade of marriage together!! For our 10th anniversary we knew that we wanted to travel but weren't quite sure where. We finally settled on the UK and decided to split up our trip into three parts, London, Scotland and London. Because I have SO much to share about our trip and because I'm not quite ready for our adventure to be over, instead of sharing it all in one long blog post I've decided to break our trip down into several parts. First I'll be sharing the amazing destinations we visited in a multi-post series. Next my hope is to share the delicious places we ate (because let's be real, we planned this trip around FOOD ;)) along with a review of the places we stayed and some of the amazing experiences we enjoyed while on vacation!! Are you ready?! Our first stop was London. This was my third trip to this bustling city and it was still full of the charm and character that made me fall in love with London years ago. It was the perfect destination for our trip, filled with things to do but also relaxing enough to simply sit and enjoy a cup of coffee together. It was a great mix!! For the first three days our trip we stayed in Kensington and filled each day with site seeing and eating. We absolutely adored the Kensington neighborhood, filled with coffee shops, diners and locals - it felt far removed from the hustle and bustle of central London and the craziness that is the European summer tourist season. This was our part of the trip to see the sights and we did a LOT of walking, shopping and "touristing". Highlights included Liberty of London (A MUST for the building alone), Nopi, Victoria and Albert Museum, BBBakery Tour, Notting Hill and more -- I promise to break this all down in an upcoming post! !